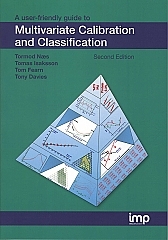 A user-friendly guide to Multivariate Calibration and Classification ISBN 978-1-906715-25-0 inspiration and most of the material came from the Chemometric Space columns that appeared in NIR news since 1991. There have been occasional guest columns over the years, but one or more of the authors of this book wrote most of the material. The authors are all very well known in the field and they bring a complementary range of experience and interests to this project. A user-friendly guide to Multivariate Calibration and Classification provides a readable text, for non-mathematicians, as an introduction with little or moderate knowledge of chemometrics. 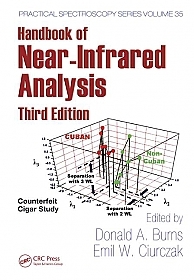 It is aimed specifically at readers using chemometrics in the context of near infrared (NIR) spectroscopy. The techniques described are, however, much more widely applicable. 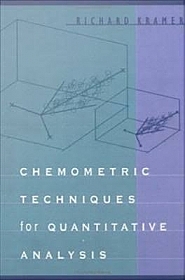 Thus, although the columns were our starting point, our aim in rewriting and expanding them was to make this book a useful one for any chemometrics practitioner. Most of the examples still involve NIR spectroscopy, and some material that is specific to this application has been included, but we have tried to emphasise the generality of the approaches where ever possible. The book has been designed in an attractive and easily read format, with many diagrams and the use of margin notes to highlight important features. This Second Edition includes Digital Object Identifiers (DOIs) for references where these are ­available, facilitating the finding of references online. Tormod Næs has a PhD in statistics and is Senior Scientist at Nofima and Visiting Professor at the University of Copenhagen. His main interest is developing and applying multivariate methods. The late Tomas Isaksson was Professor of Food Science at the Agricultural University of Norway. He worked in the area of non-destructive quality analysis and chemometrics. Tom Fearn is Professor of Applied Statistics at University College London. He has worked in the area of multi­variate calibration and discrimination for over 30 years. Tony (A.M.C.) Davies first used multiple regression analysis in 1965. He works as an NIR consultant and has been writing about chemometrics since 1989.